What is the Civil Service Exam? Civil Exam is a comprehensive test given to professionals who aspire to work in a government office with permanent status.Passing the exam is a prerequisite to many government jobs at the local, state and federal levels. These civil service jobs may each require a different civil service exam, depending on the situation. As to the test questions are generally split between those related to general knowledge and academics, as well as specific knowledge requirements based on the job. How to pass the Civil Service Exam? 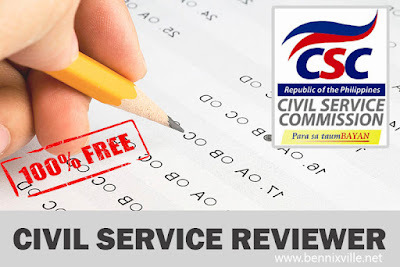 Generally, the best thing to do in order to pass the Civil Service Exam is to understand the nature of the test and be prepared for it by doing self-reviews, mock test, and lot's of practice especially if you're no longer an active student for years. Do a lot of math practice exam. Time is your enemy in math problems. Noticeably, most successful examiners in Civil Service Exam are 75% good in Math. Buy latest printed reviewers from National Bookstore or download our free reviewers herewith. Practice your speed in answering 170 questions in 3 hours or 1 questions per minute ratio. Avoid errors in shading your answers. Stay focus during and follow the instructions carefully.